Turn the car on. It is best to warm up the engine before beginning the inspection process. Find the transmission fluid dipstick. For front-wheel drive cars, you will likely find it to the right of the oil dipstick. If you cannot find it, your owner’s manual should show you where it is located. Remove the dipstick and touch the fluid. You should move it around between your thumb and forefinger to check its consistency. The fluid should appear almost clear but have a pink hue. If you notice a burning smell or the fluid looks dirty and contaminated with debris, it is time for a fluid replacement. Use a rag to wipe off the dipstick. Then insert it back into the vehicle. Pull it out again to check the level. If it’s under the “Full” marking, it is time to add more transmission fluid. Use a funnel to bring the fluid level up to full. Be sure not to overfill it. If you run into any issues, feel free to check with Green Dodge, providing service to customers from Chatham and beyond. How Often Do You Check Your Transmission Fluid? Ideally, you should make time to check the fluids in your vehicle every month, including your transmission fluid, power steering fluid, and engine oil. If you would like a more specific maintenance schedule for your particular make and model, consult your owner’s manual. 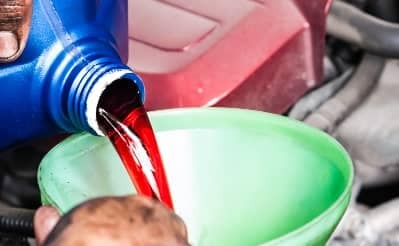 Transmission fluid can vary depending on your particular vehicle and transmission. Your owner’s manual will recommend the right kind of transmission fluid. Checking the fluid on a manual transmission will usually require a jack to access a plug located beneath the car. Unless you prefer to do your own vehicle maintenance, it is usually best to set up an appointment at our service center. If your vehicle hesitates before shifting gears, it might be due to low transmission fluid. However, it may not be as simple as that. Check the fluid level first, but if it’s fine, you may want to get your vehicle inspected for a more serious problem. You’ll want to replace your transmission fluid every 50,000 to 100,000 miles. The actual amount depends on your driving habits, type of transmission, and other factors. Check your owner’s manual for a more specific replacement interval. If you have any questions about how to check your transmission fluid or any other vehicle maintenance tasks, we would be glad to help! Contact our service center at (217) 718-6856 or stop by our dealership near Rochester.